System is 108” wide x 67” deep (149” including hoist monorail) x 305” tall. 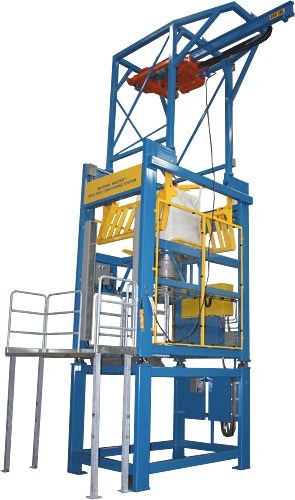 2-Ton spark resistant wire rope hoist with motorized trolley for efficient bag loading. Heavy wall structural tube main frame with continuous welds. Frame finished with a PPG Marine coating. Twin hydraulically actuated tubular steel pivoting conditioning arms. Hydraulically actuated heavy-duty Flo-Master™ “breaker bar” bag massaging system. Flo- Lock™ discharge spout closure system. Exclusive stainless steel Seal-Master™ bag spout access chamber with “gull-wing” doors. Dust-tight Sure-Seal™ spout clamping system. 12” diameter, 316 stainless steel lump breaker. Heavy-duty Mettler-Toledo stainless steel weigh modules. Full machine guarding with light curtain. Hot dipped galvanized carbon steel work platform (not all platform supports shown). Premium quality Parker hydraulic system with a 10 HP motor. Hydraulic system includes a custom carbon steel enclosure. Intrinsically safe pneumatic controls for Sure-Seal spout™ clamping system and Flo-Lock™ gate. For Class I, Division II, Groups C & D.